Apply online Indian Coast Guard for the post of Yantrik. Diploma holders can apply for this batch from 12 to 19 Jan 2018. Course will be commencing August 2018. What is the qualification for applying Yantrik post? Matriculation pass and having diploma in Electrical/Mechanical / Electronics and Telecommunication (Radio/Power) Engineering from AICTE approved institute with minimum 60% of marks in aggrigate. Extra 5% relaxation will be exceptable in cut off to the SC/ST candidates and outstanding sports person. Age limit for Yanrik Recruitment. Candidates who are under age of 18 to 22 years are elligible and upper age relaxation for SC/ST candidates is 5 years and 3 years age relaxation for OBC candidates. Sallary of Yantrik in Coast Guard. (7th pay commission implementation) plus Dearness Allowance and other allowances based on nature of duty/place. How to apply Coast Guard Yantrik Recruitment (Bharti)? 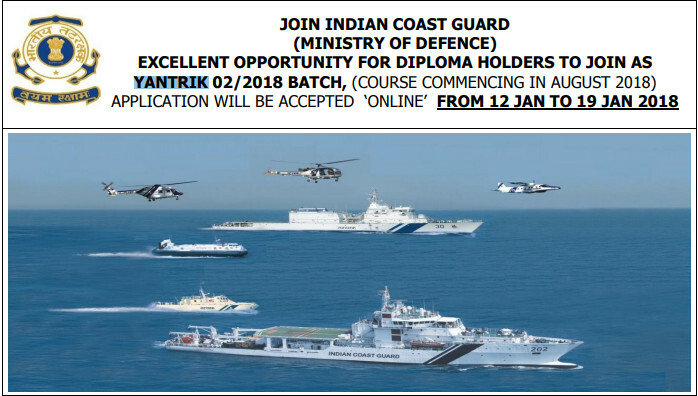 Visit official website www.joinindiancoastguard.gov.in from 12 to 19 Jan 2018. Candidate name and Father name Date of birth shoud be as per 10th class certificate. E-maill address and mobile number required. Read the instruction and click on "I agree" button. my Date of birth is 21/02/1993,completed Dip in Electronic & communication...Am I eligible to apply for this job...?